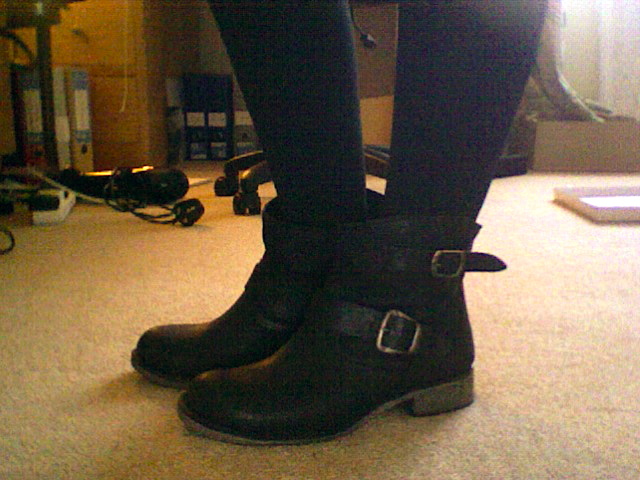 My replacement Report boots finally arrived! (After ordering what I thought was a UK size 3 from Piper Lime I belatedly discovered the sizing was a tad on the ambitious side and had to go up one. Piper Lime had sold out by then but luckily Nordstrom came to the rescue! So all's well that ends well.) They're stupendous. This is how I wore said boots on their first outing - with a Topshop denim dress and boyfriend coat and some jazzy H&M earrings. I love your jacket! It really looks so much more fabulous on you than on the website. Your boots are really cute too! I have these earrings in pink - love them, although always forget I own them! So glad the boots worked out! They will go with everything! So chic! The boots and those earrings will be in my bucket list. Got my eye on your next posts.